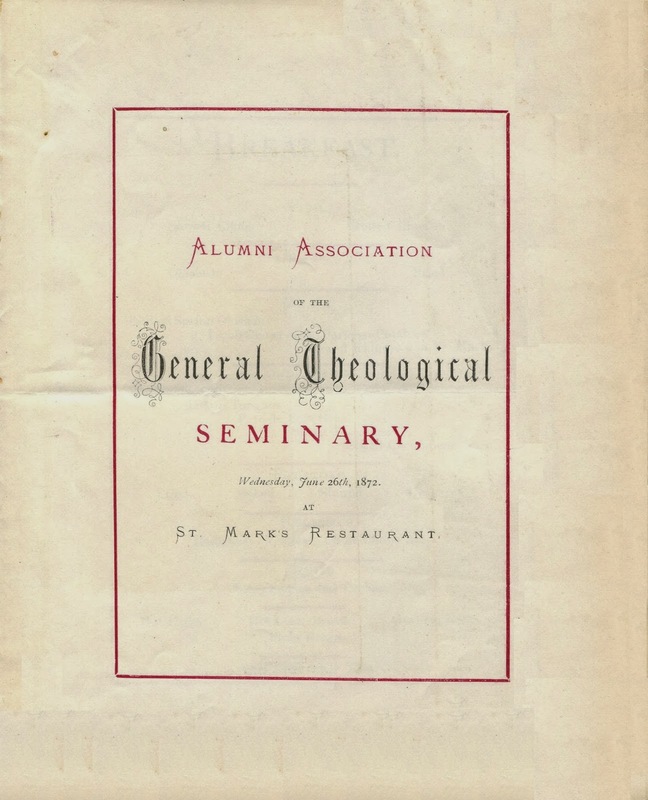 On the morning of June 26, 1872, the Alumni Association of the General Theological Seminary met for breakfast at St. Mark’s. 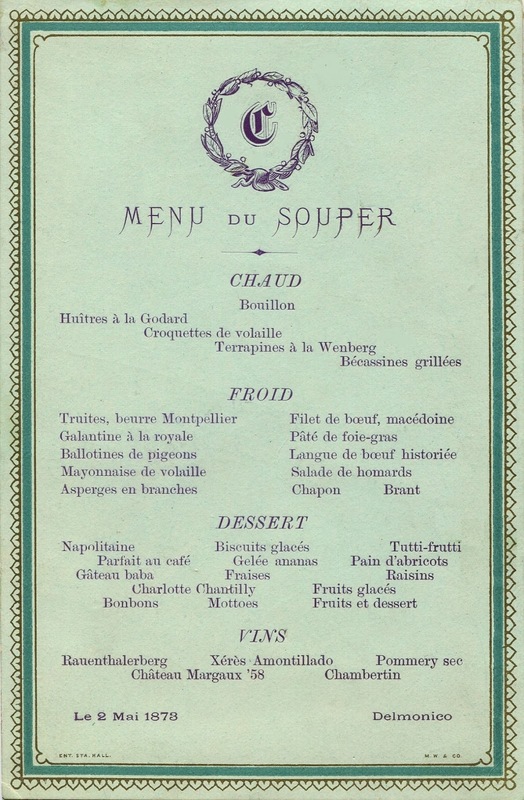 This set menu reflects the French, English, German, and American influences that comprised the main themes of New York cuisine. 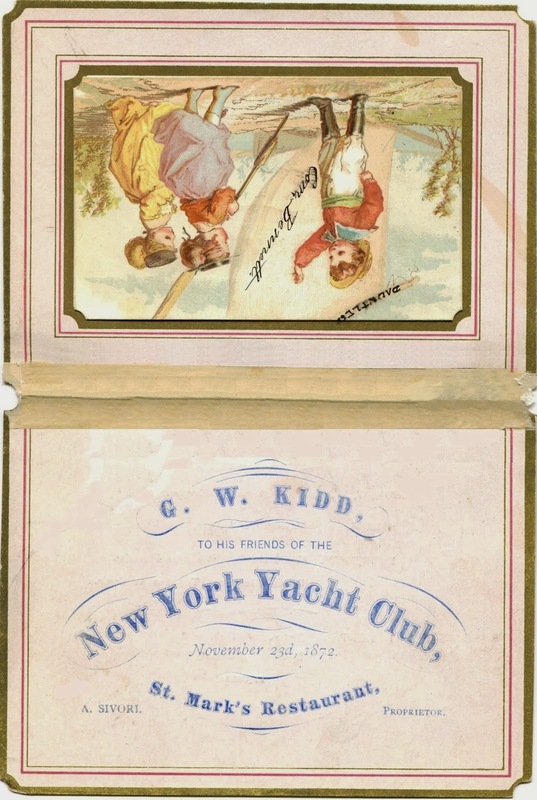 Whiskey-manufacturer George W. Kidd hosted a dinner at St. Mark’s for fellow members of the New York Yacht Club in November 1872. 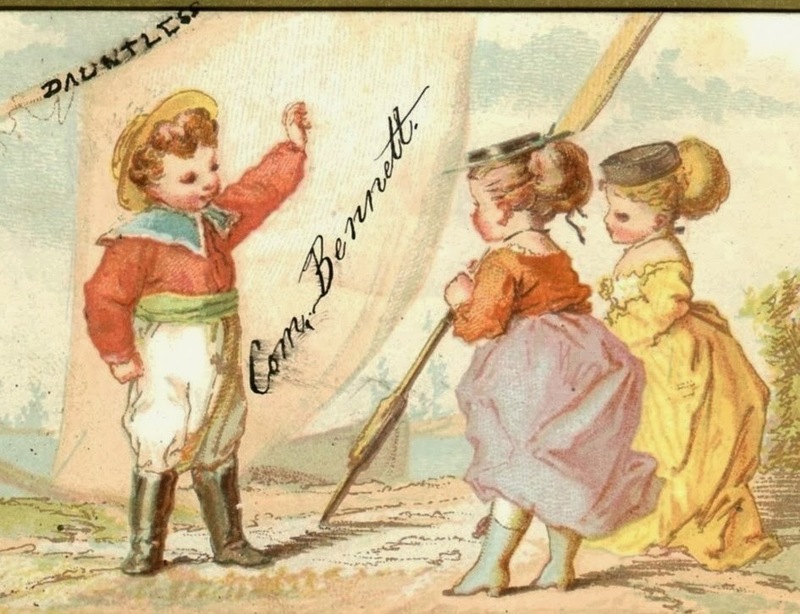 The cover is inscribed “Commodore Bennett,” referring to James Gordon Bennett, Jr., the flamboyant publisher of the New York Herald, and with the name of his large schooner “Dauntless,” the Club’s flagship. These notations transform this sugary Victorian illustration into a comic scene, showing the thirty-one-year-old sportsman being admired by two young women. The dinner at St. Mark’s was a modest affair for these wealthy yachtsmen. 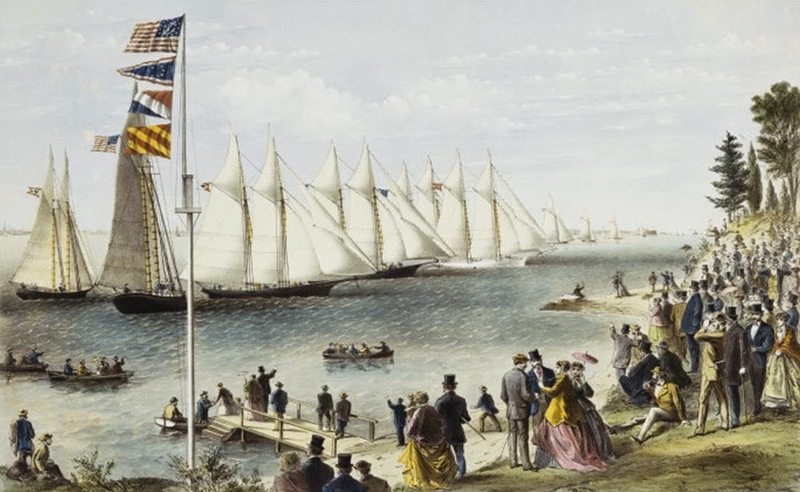 With Commodore Bennett in the lead, one hundred members of the New York Yacht Club hosted a banquet at Delmonico’s in December 1871 for Grand Duke Alexis of Russia. This lavish affair reportedly cost $5,000, or about $95,000 in today’s dollars. At the time, little could they have imagined that the period of economic prosperity that followed the Civil War would soon be coming to an abrupt end. The financial markets crashed on September 18, 1873. Although the fear on Wall Street subsided after a few days, the panic had already triggered a severe depression, causing thousands of companies to fail and farm prices to collapse. Ten states went bankrupt. Although there was suffering and distress throughout the country, the highest levels of unemployment, homelessness, and hunger were concentrated in the industrial cities like New York. 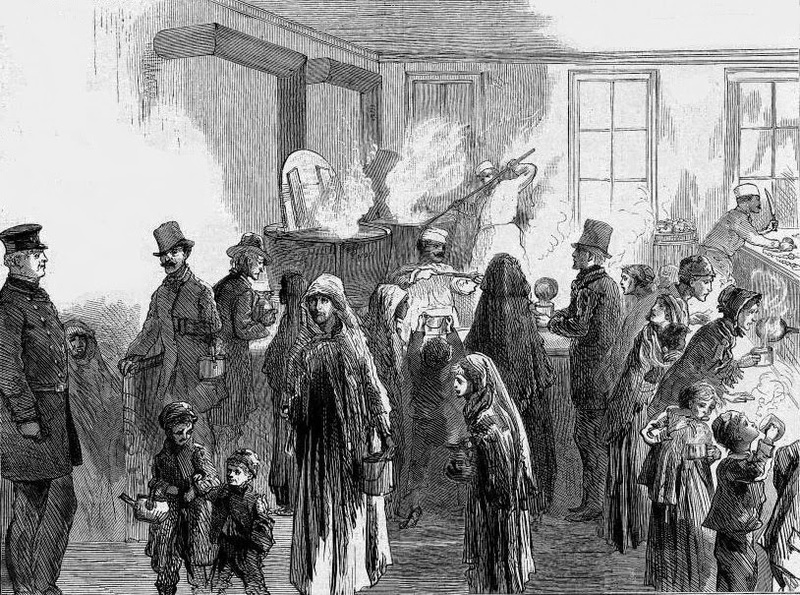 The economic calamity dragged on until March 1879, making it was the longest depression in American history. In the spring of 1873, following the closure of his restaurant, Sivori began working for Delmonico’s, and then branched out, doing catering jobs for the Windsor Hotel, the caterer George E. Greene & Son, and the Union Square Hotel. During this dark and uncertain period, Sivori seems to have taken work where he could find it, networking with friends, colleagues, and former employers to himself afloat. 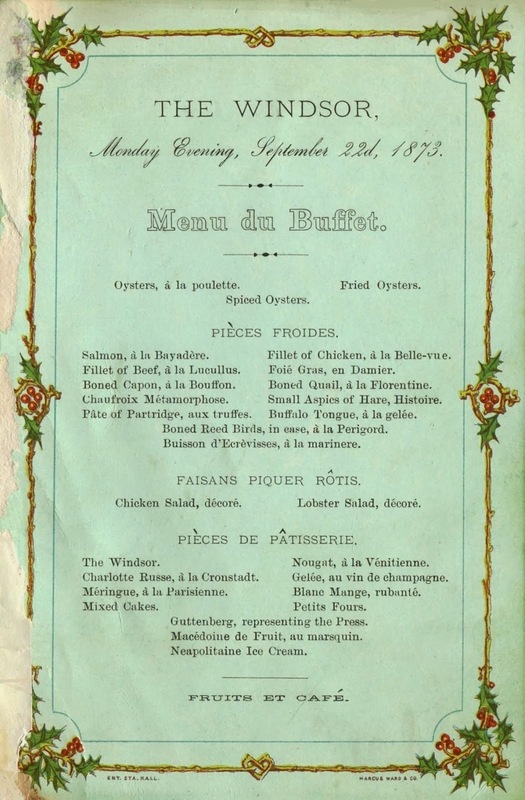 The menu below from the Windsor Hotel is dated only four days after the Great Panic of 1873. The luxury hotel had recently opened (or was just then opening) on Fifth Avenue at 47th Street, far from the turmoil that was engulfing the city’s financial center. 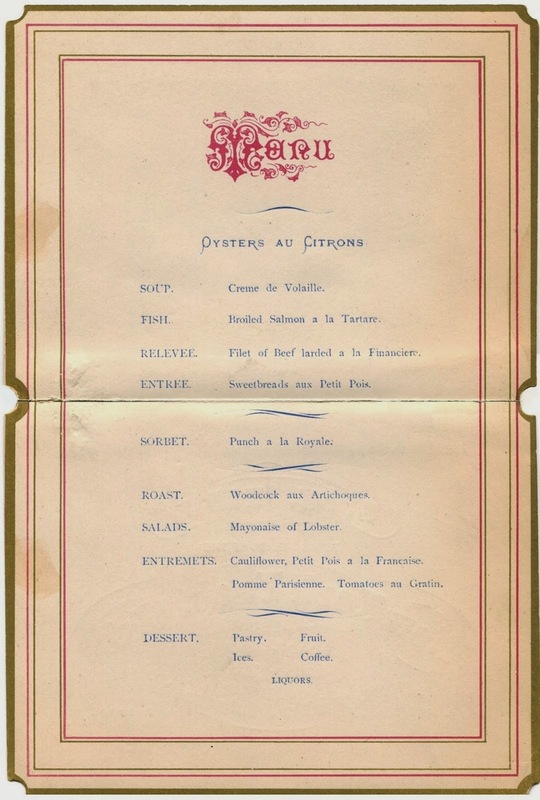 Featuring cold dishes like fillet of beef à la Lucullus, buffalo tongue à la gelée, and boned reed birds à la Perigord, this elegant buffet supper may have been related to the début of the hotel. 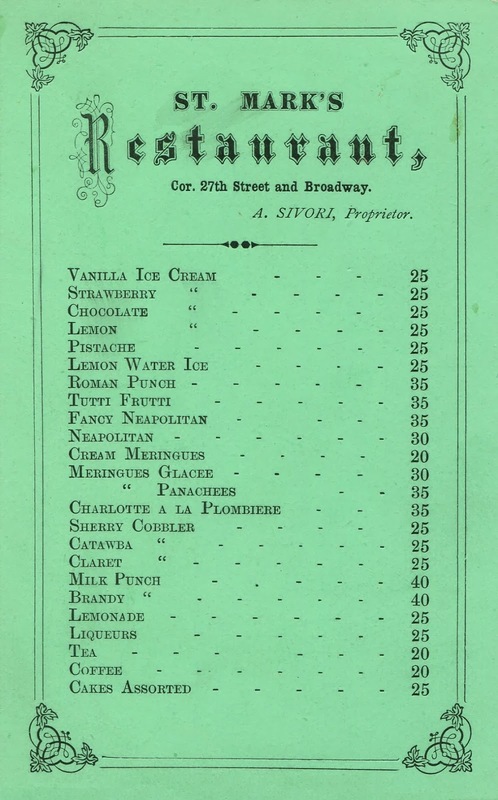 Surprisingly, nine of the forty-five menus supposedly saved by Sivori bear the name “Delmonico.” They come from dinners, banquets, and late suppers in the mid-1870s, many years after Sivori’s apprenticeship at this restaurant, raising the question as to whether these particular menus originated from some other source. 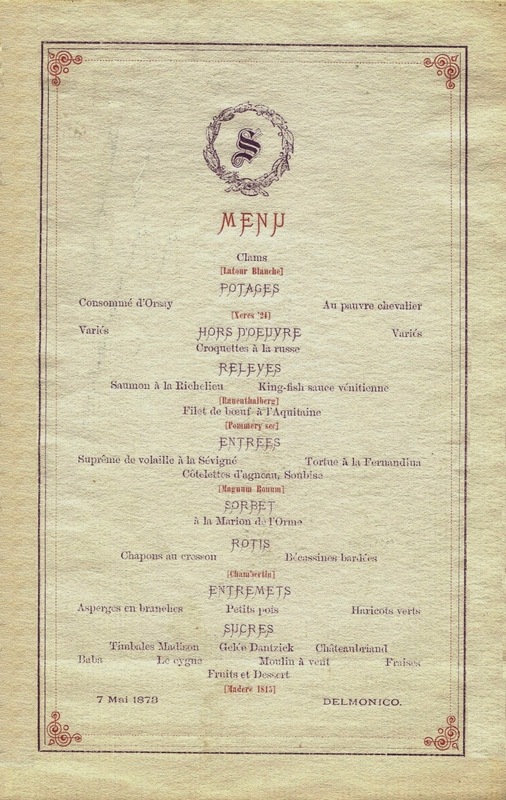 However, in 1893, the New York Times reported that “for seven years, under Charles Delmonico, (Sivori) was caterer for most of the great balls in New York.”5 According to the historical evidence provided by these menus, Sivori was one of the city’s foremost caterers for about that period of time. However, they also show that he was associated with Delmonico’s for only about two of those seven years. 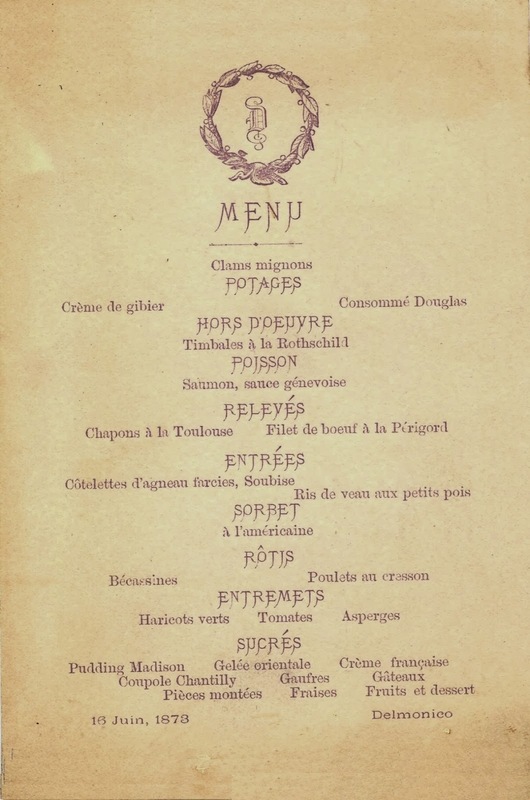 The menu below comes from a late supper on May 2, 1873. 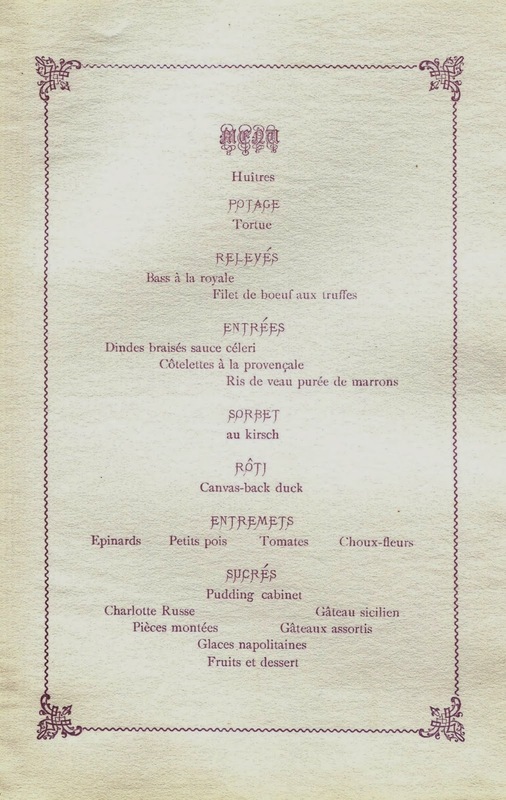 Chef Charles Ranhofer often named dishes that he created after French writers and their literary works. One of the entrees shown below is named after Madame de Sévigné, the preeminent writer of epistles in the seventeenth century. The sorbet is named after Victor Hugo’s Marion de l’Orme, a drama about a courtesan in the 1640s. 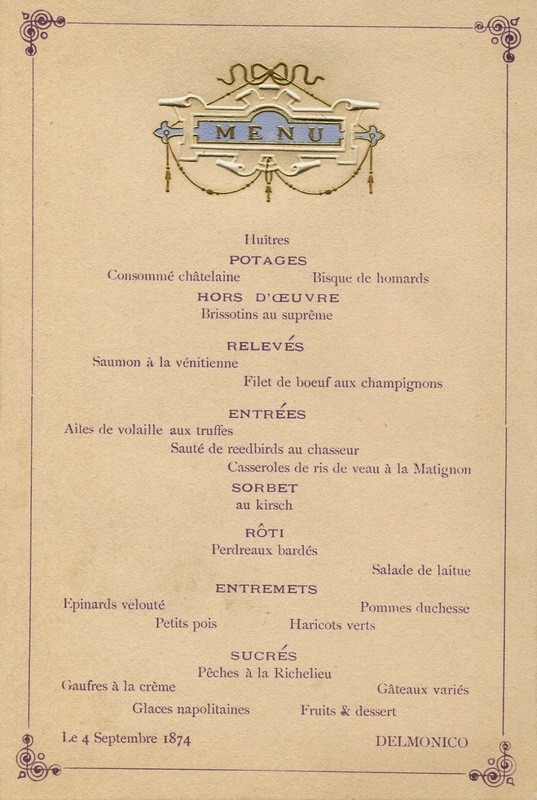 According to custom, only a few simple desserts were served at dinners where there were no women present, as shown on the above menu, and also on the one below dated June 16, 1873, three months before the financial collapse. Ornamental typeface was then coming into vogue, bringing a stylistic flair to such menus. 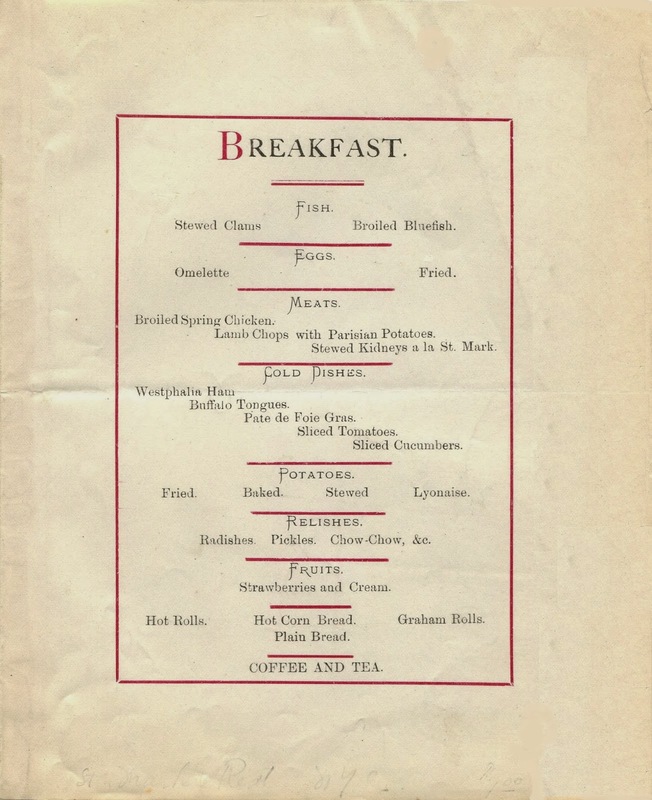 The printer employed a popular font design called Monastic for the quirky headings on these menus. Delmonico’s restaurant even felt the pinch of the hard economic times to some extent. While talking to a newspaper reporter, Charles Delmonico recalled that there used to be several bottles of wine on every table at their uptown branch on 14th Street, “but now, if we hear a cork pop, we turn to see where it is, and it is generally a bottle of Bass.” Nevertheless, the upper classes still had money to spend, as shown by this dinner held for the second annual reunion of the Yale Alumni Association on December 12, 1873. 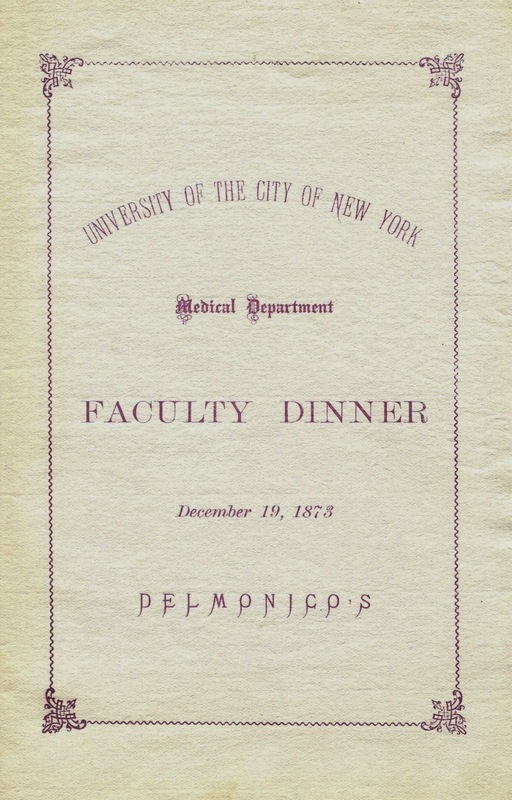 The Medical Faculty of New York University held its annual dinner on December 19, 1873. These refined banquets took place at a time when everyday life was becoming increasingly desperate for many people. 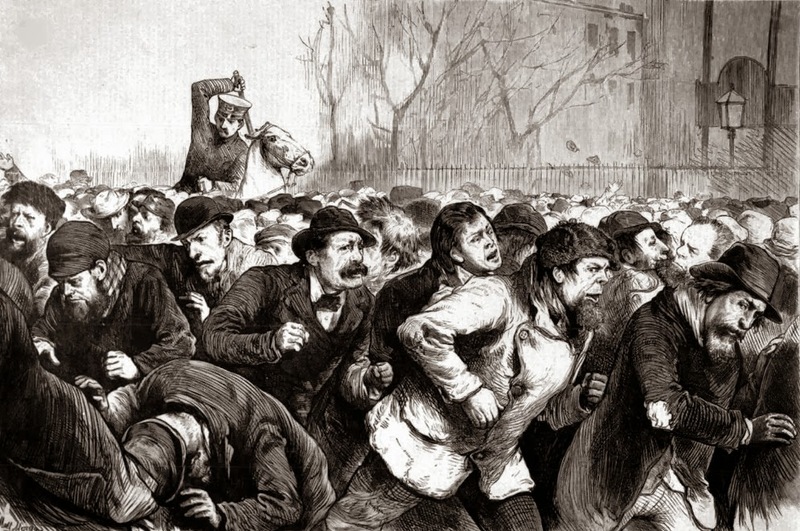 In January 1875, Frank Leslie’s Illustrated Newspaper published this chaotic scene titled: “The Red Flag in New York,” showing mounted police driving riotous “communist workingmen” from Tompkins Square, only twelve blocks from Delmonico’s. 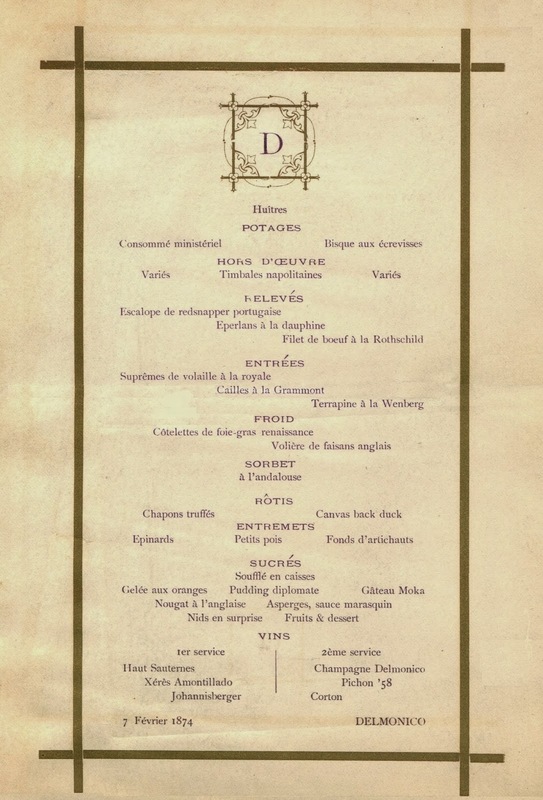 Three scarce menus below come from unidentified banquets at Delmonico’s in 1874, the first full year of the great depression, when the number of such catered events in New York may have significantly decreased. 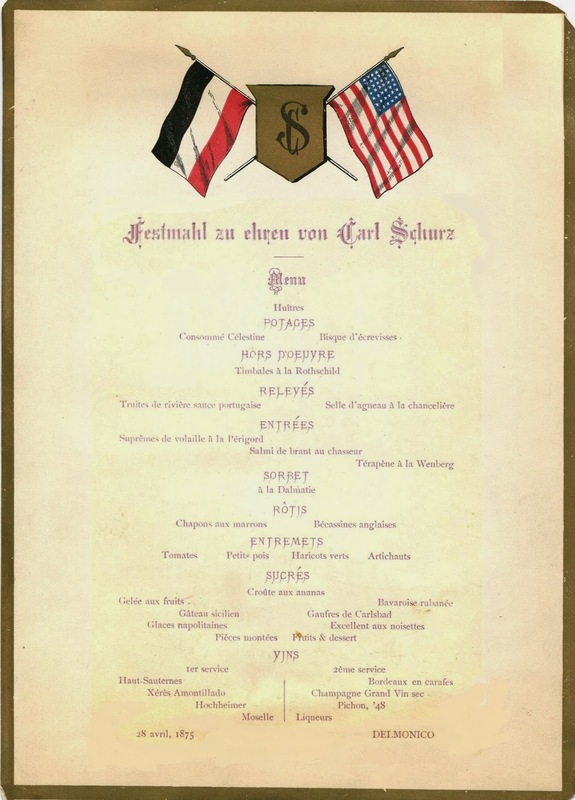 In April 1875, a banquet was held for Carl Schurz, honoring one of the most widely admired statesmen in the country. After achieving success as a general in the Civil War, Schurz went on to become the first German-born citizen to be elected to the Senate. German-Americans comprised thirty-five percent of the city’s population, making it the second-largest ethnic group. 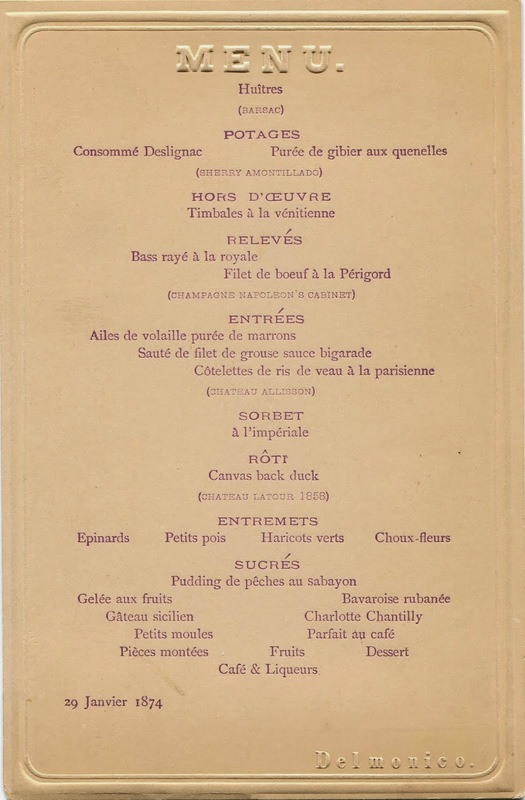 Sivori was probably not working for Delmonico’s by this late date, suggesting that he may have saved this menu as a personal memento. 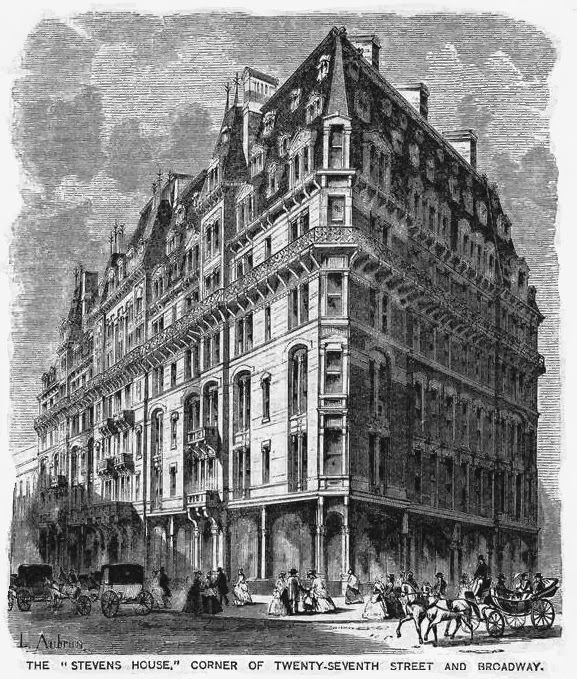 In the next post, we will pick up the story at Union Square Hotel, where Sivori’s title changed from “caterer” to “steward” in February 1874, indicating that he had finally become a full-time employee of this hotel. 1. Opening in 1870, the “Stuyvesant” at 142 East 18th Street is generally regarded as the first apartment building in New York. It was also designed by Richard Morris Hunt. The luxurious Stevens House proved to be ahead of its time and was eventually transformed into the transient Victoria Hotel in 1879. 2. In the widely-reported dispute in 1878, Mrs. Paran Stevens, the unpleasant owner of the Stevens House, unsuccessfully tried to evict an Italian barber named Thomaselli who was subletting the basement of Ward & Hubbell’s store in the Stevens House. There is no evidence that Sivori had any run-ins with this notoriously difficult socialite, but it is not out of the question. In 1871, Sivori got into a legal wrangle that was reported in the Tribune, and in 1880, the Times reported an incident where he displayed evidence of having a mercurial temperament. 3. Immigration from Italy totaled roughly 70,000 in all the years prior to 1880, mostly from the northern Italian regions of Liguria, Piedmont, Lombardy, Veneto and Tuscany. Caffè Moretti, one of the few Italian restaurants in New York, began in a basement on Cedar Street near the financial district in the 1850s. Its proprietor, Stefano Moretti, also claimed to have been a seminarian in Italy before immigrating to the United States. William Grimes, Appetite City, 2009, p. 96. 4. New York Herald, 25 March 1893. 5. New York Times, 26 March 1893. 6. Thomas Lately, Delmonico’s, 1967, p. 153. 7. In 1872, Trow’s Directory of New York City incorrectly lists the address of this firm as 15 East 80th Street. Interestingly, this directory shows that a waiter named George Greene lived at 38 Cornelia Street in the West Village, just a few doors down from where Pō now operates, the little Italian restaurant established in 1993.
this is a page turner! Love the Sivori story and the Delmonico's menus with the dripping typeface. Excellent indeed. Interesting that most menus do not mention wines, yet some do. All the main types are still with us: the great classified growths, fine sherries, sauternes old Madeira, good hock, and good old Bass Ale. Then, as now, beer gets the second rating from the arbiters, but that's okay. Henry, Bass Ale has a long identification with New York, as Guinness does. You see both regularly advertised into the modern era. Wonderful as always! 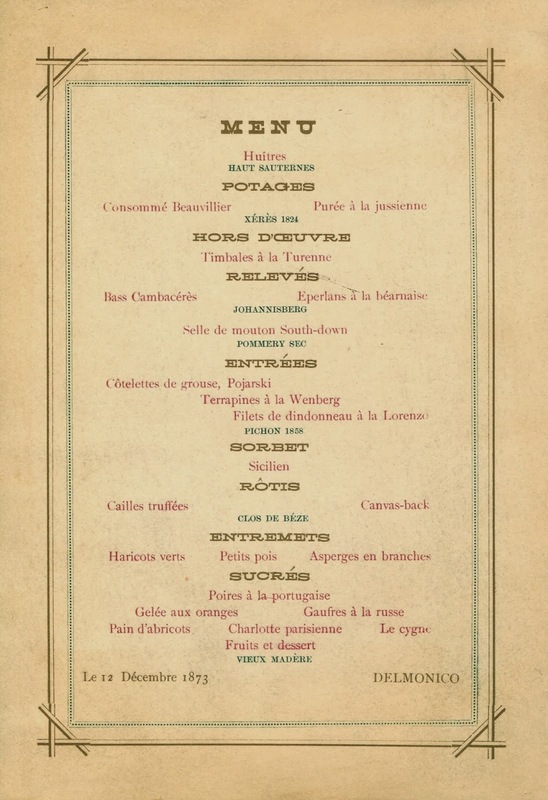 I am intrigued by the Terrapines a la Wenberg on the green Delmonico's menu of May 1873. Could it be the same Wenberg for whom Lobster Wenberg/Newberg was supposedly named, the name being reversed when the man became offensive?